RALEIGH, N.C. — If by a near-miraculous alignment of the hockey cosmos the Islanders qualify for the Stanley Cup playoffs, they likely will do so with a goaltender whose tale is appropriately unlikely for the circumstances. Jaroslav Halak was sent to Bridgeport of the AHL on Dec. 30. He spent almost three months there, returned on March 23 and won his first start against the Penguins the next day. Then the Islanders lost three in a row, Halak replaced Thomas Greiss, and he now has won three consecutive starts — while allowing a total of four goals — when a loss in any of them would have meant the Islanders were through. Instead, they still are alive (barely) entering Thursday night’s game against the Hurricanes and Halak is well on his way to re-establishing his bona fides. “He was a pro down there,” interim coach Doug Weight said of Halak’s time with the Sound Tigers, for whom he went 17-7-3. “He’s riding that confidence wave. He did all of the above, winning over his teammates, who had little trouble recognizing the NHL-caliber goalie skills in their midst. 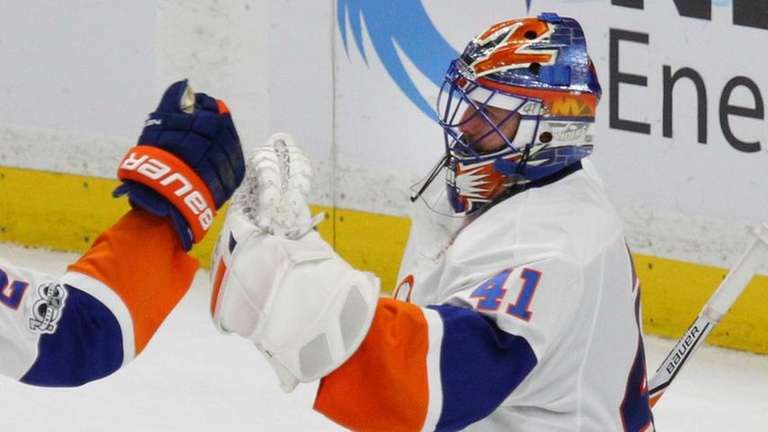 Halak, 31, who has one season left on his contract, credited his teammates for helping make his return triumphant. But he has done his part. “You always want to prove yourself that you can still play,” he said. Even if Halak makes it four in a row Thursday night, it might well not be enough. The Islanders have 88 points with three games to play. First, they must win all three to beat out either the Senators (94 points) or Maple Leafs (93). To catch the Senators, Ottawa would need to lose all three of its games — the last one against the Islanders — in regulation time. To catch the Maple Leafs, Toronto would have to lose all three, but one could come in overtime or a shootout under some tiebreaker scenarios. So, not good. Not good at all. But at least, thanks to Thomas Hickey’s overtime tally against the Predators Tuesday, the Islanders will take the ice against the Canes still in contention. “The stress has been there for a while, and I guess you can sit there and worry about it, or you can take care of whatever you can take care of,” Cal Clutterbuck said. Adding to the Islanders’ degree of difficulty is injuries, five of them to forwards, which forced Weight to deploy Hickey, a defenseman, as a left wing on Tuesday. Weight said he would be “100 percent” comfortable using Hickey there again. But one injured forward, Nikolay Kulemin, flew into Raleigh on Wednesday and skated with the team. The coach called Kulemin “a big, important piece” and said he would decide whether to dress him based on how he feels on Thursday morning. Weight added Kulemin likely would not have been summoned at all had the Islanders not stayed alive Tuesday night.